when purchasing a vehicle. You can also search ratings by manufacturer. Check your car seat's Ease of Use Ratings. NHTSA’s Ease of Use Ratings let you compare how easy it is to use certain car seat features so you can make an informed decision about the right car seat. consumers to compare tire features. Purchase a vehicle with safety in mind. Use NHTSA's Vehicle Comparison Tool to see 5-Star Safety Ratings and recall information at a glance. The Highway Safety Act established NHTSA and outlined its mission to reduce deaths, injuries and economic losses resulting from motor vehicle crashes. Began testing and rating vehicles for frontal impact protection using data from crash test dummies. Began using the 5-Star Safety Ratings system to help consumers make informed safety choices when buying new vehicles. Began testing and rating vehicles for side crash protection. Began testing vehicles for resistance to rollover crashes, which are more dangerous than other types of crashes. Rollover tests are updated to better simulate real-world rollover crashes. Launched SaferCar.gov (now NHTSA.gov) so consumers can search for 5-Star Safety Ratings and find other important highway safety information in one place. Required that window labels on new vehicles include 5-Star Safety Ratings information. Enhanced 5-Star Safety Ratings to include an Overall Vehicle Score and a listing of advanced recommended safety technologies. Added rearview video systems to the list of recommended technologies to help prevent backover incidents. This feature will be standard in all vehicles by 2018. Announced plans to update its 5-Star Safety Ratings program and encourage automakers to produce cars with better crash protection and new crash avoidance technologies to save more lives and reduce passenger and pedestrian injuries. 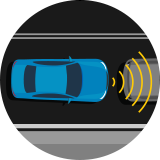 Added automatic emergency braking systems to the list of recommended technologies to help prevent or reduce the impact speed of rear-end crashes starting with model year 2018 vehicles. Automakers committed to making it standard in all vehicles by 2022. Download this brochure to get more information about NHTSA's 5-star safety program and our testing and rating milestones. More stars mean safer cars. The 5-Star Safety Ratings program evaluates how vehicles perform in crash tests. NHTSA conducts frontal, side and rollover tests because these types account for the majority of crashes on America's roadways. 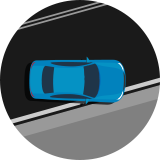 You are heading south on a two-lane road, while another vehicle is driving north on that street.The driver in the other vehicle starts to fall asleep at the wheel and veers into your lane. Suddenly, you collide head-on with the northbound vehicle. You pull up to a four-way intersection and make a complete stop, look to your left and right and begin to accelerate into the intersection. Another vehicle approaches the same intersection, but doesn’t yield at the stop sign and hits your vehicle on the driver’s side. On a rainy afternoon, you’re driving down a curved street in your neighborhood. All of a sudden, you lose control of the vehicle. You start sliding on the road sideways and crash into a telephone pole on the driver’s side. You’re driving your SUV on a 55 mph highway and suddenly you come upon a sharp curve. You try to navigate the curve, but you’re traveling too fast and losing control of your vehicle, and your vehicle departs the road and rolls over. 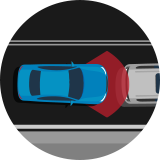 The rollover resistance rating is based on an at-rest laboratory measurement known as the Static Stability Factor (SSF) that determines how “top-heavy” a vehicle is, and the results of a driving maneuver that tests whether a vehicle is vulnerable to tipping up on the road in a severe maneuver. 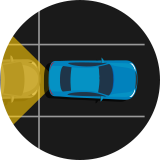 Look for vehicles with these driver assistance technologies. These features have met NHTSA performance tests. Other safety equipment provides protection and reliability on the road. When purchasing a vehicle, check for these features. What is the 5-Star Safety Ratings Program? The National Highway Traffic Safety Administration’s New Car Assessment Program (NCAP) created the 5-Star Safety Ratings Program to provide consumers with information about the crash protection and rollover safety of new vehicles beyond what is required by Federal law. One star is the lowest rating; five stars is the highest. More stars equal safer cars. Which cars are we testing? Make, model and body style of cars being testing in 2018. Do other organizations crash rate vehicles? Yes, other organizations test crash vehicles, but NHTSA is the only organization that rates rollover resistance, in addition to frontal and side crashworthiness. Do the changes in the new Safety Ratings mean vehicles that previously received 4- or 5-star ratings may get lower ratings even if no changes have been made to the vehicle? Yes, some vehicle star ratings that were rated higher under the older Safety Ratings system may be lower under the new 5-Star Safety Ratings system. However, it does not mean that your current 4- or 5-star vehicle is unsafe. Due to more vigorous testing, a vehicle that once received 5 stars under the old system, may receive a lower score under the new system, even if no changes have been made to the model. Why doesn't NHTSA do rear impact crash ratings? NHTSA’s 5-Star Ratings Program has a limited budget and must concentrate its ratings on front and side-impact crashes that are responsible for the highest percentage of deaths and serious injuries. How does NHTSA categorize vehicles? NHTSA categorizes vehicles by class and “curb” weight. Curb weight is the weight of a vehicle with standard equipment including the maximum capacity of fuel, oil, coolant, and air conditioning. Passenger cars are further subdivided. Can I compare vehicles from different classes? Side crash rating results can be compared across all classes because all vehicles are hit with the same force by the same moving barrier or pole. Rollover ratings can also be compared across all classes. Frontal crash rating results can only be compared to other vehicles in the same class and whose weight is plus or minus 250 pounds of the vehicle being rated. This is because a frontal crash rating into a fixed barrier represents a crash between two vehicles of the same weight. What does it mean if the symbol (�) appears on a vehicle’s ratings label? This symbol alerts consumers to a safety concern the government has about the vehicle. That concern can include: structural failure or some type of unintended performance of a vehicle component such as a fuel leakage or a door opening. Please note that safety concerns are NOT part of the calculation for an Overall Vehicle Score. A vehicle can have a high star rating, but still have a safety concern. However, if a safety concern is identified, the symbol will appear in the correct crash category and Overall Vehicle Score area. For more than 50 years, the National Highway Traffic Safety Administration has been working to keep people safe on the road. Learn more about what we do and how we enable everyone to live safer.